Your true essence is your best strategy. Do You Want to Attract Your Ideal Clients, Make More of an Impact and Strategically Grow Your Business? Business Coaching for B2B service professionals and business owners who want to grow a 6-figure+ business. You want to make more money and earn consistent revenue, reach more of the right people, and grow your client base more strategically with prioritized action steps to keep you focused on what’s important (rather than shooting in the dark.) Knowing the next best steps for how to grow your business is important to you. You think of yourself as a visionary, creative, or freelancer and you want to feel like you have a real business, not just a job. Gain business traction and ignite your business to the next level of growth. When you work with me, you will get the one-on-one support to help you get from where you are right now, to where you want to go, so you can get better results, with less effort. 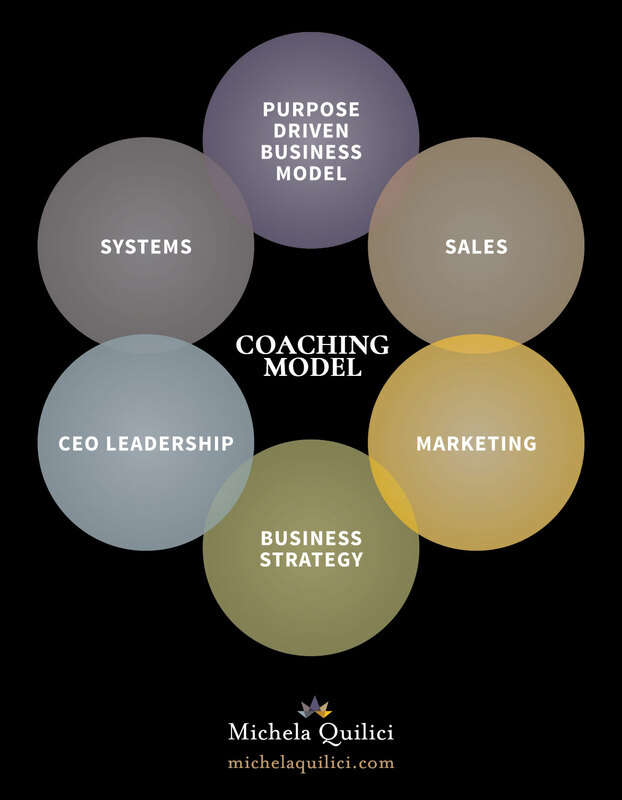 WHAT ARE THE BUSINESS COACHING PROGRAMS ABOUT? A comprehensive system of strategic marketing and sales conversion drives predictable growth. We will develop your customized marketing and business growth plan to increase sales and profitability. With a clear focus on revenue-generating activities and practices that plug time and money leaks, you’ll be positioned to step fully into your brilliance as you market your business from the inside out. This program combines proven, practical and strategic business growth strategies and tactical support, with strong intuitive guidance, skills and mindset training to accelerate personal and business growth. We will connect the dots between your business vision and your outcomes, by creating results-focused marketing, sales and business development strategies with the tools, templates and support you need to clear away the clutter and generate success. Get a big-picture framework with goalsetting and specific action steps. I get to know you and your business at a deep level, and I completely immerse myself in your journey. I work at both an intuitive and strategic level to support you to create what you need to ignite your business to the next level of growth. This highly focused one-on-one, done-with-you coaching will guide you step-by-step for how to grow and leverage your business, and you will take actions in between sessions to apply the strategies, knowledge and tools that you learn, directly into your business in real-time. It’s difficult to succeed at the outer game of business, without working on your inner game of expanding your emotional intelligence and developing your human potential. Your success is dependent on doing both. Part of the power of private coaching and consulting is the focus and accountability to take regular action, hands-on tactical support, and the guidance to course correct. It’s an apprenticeship model, which is the most successful model out there for learning that leads to results. WHAT DO THE COACHING PROGRAMS INCLUDE? Business Strategy Assessment to get CLARITY on your expectations, business model, business and financial goals, marketing and sales process, brand positioning, target markets, and areas of improvement. Strategic Planning Workshops to build your Profit Model, Service Packages and Pricing, Qualified Buyer Profile with Key Messages, Unique Differentiators, Marketing Plan & Sales Process. One-on-One Virtual VIP Coaching to GUIDE YOU hand-in-hand through your business development and personal mindset. Ongoing Email Support throughout the length of the program to answer your questions via email, help you with your action items, clarify your course of action, and feedback on your current activities. Personalized Support including the HOW TO for executing with excellence on the strategies and tactics we develop, including my personal reviews and recommendations for tweaking your marketing, communications and sales tactical approach, client acquisition systems, conversion processes, verbal scripts, sales messaging, pricing and packaging, content, calls to action (& more!) to generate the BEST results. Resources including my eBooks: Consultation Secrets and Fast Path to Cash. A subscription to my monthly emails with practical business building advise and tips to keep you inspired and motivated. Access to my Q Your Business Success online Facebook community, where you can share successes and get access to trainings, articles and more. Plus, direct access to my personal (and trusted) network of experts to support you in any area of marketing you need help with, including branding, website development, designing online programs, speaking, writing your book, creating a lead magnet, social media coaching, web video production, photography and more. You have a business idea or hobby business and aren’t working in your own revenue-generating business full-time. You’re looking for a quick fix or an easy button. You aren’t committed to fully showing up and doing the work. Let’s FAST TRACK your roadway to a successful business where you are seen, heard, and valued as you create and enjoy the business of your dreams. Ready for your customized marketing and business growth plan to increase sales and profitability? Let’s talk about the options. First, we start with the Igniter, and then we move into the Accelerator. Business Igniter 4 Month Program is a customized one-on-one business coaching, done-with-you strategic assessment, planning, and implementation incubator with accountability, guidance, and support to address foundational needs in your business. Business Growth Accelerator 12 Month Program is a continuity program available for clients who have completed the Igniter Program. It is one-on-one business coaching with accountability and support to address long-term (12 months) needs in your business. Business Plan. Co-creating a formal business plan with the intention of raising capital or bank financing. I choose my clients as carefully as they choose me. Apply for a complimentary Discovery Call to explore if we are a good fit. As an entrepreneur for 20 years, I was struggling with keeping focused and needed support to move my business forward with my new branding. I am a creative person, I tend to get many ideas and I have a hard time knowing what the next step is. Michela helped me put my chaos into order. I always got off our coaching calls feeling inspired, seen, heard, supported and guided. So nice to not feel alone with someone to share my new ideas with, positive support and an action plan put into motion. She is a coach with heart that understands the highly sensitive creative entrepreneur. Pushing my business to the next level. When I met with Michela, my business was thriving but I was overwhelmed and stressed out as a business owner. Michela helped me create structure and bring order to my business by implementing different systems that I could rely on. While pushing my business to the next level, she helped me be more confident, be in control, and see beyond what I was aiming for.